If you haven't checked out the super cool Grabit yet, make sure to check out our coverage of it here: Cool Kickstarter projects: The Grabit Robot Multipurpose Holder. 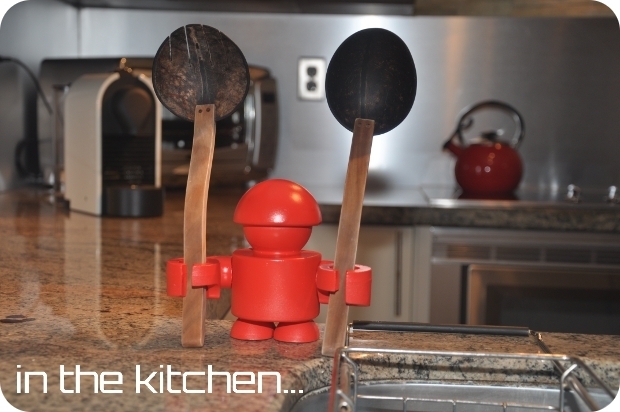 The Grabit was created by Leo and Angie Fajardo and is simultaneously a cool toy and a useful household product. Leo was kind enough to answer a few of my questions, give us the inside scoop on designing and creating the product, and even teases the possibility of some cool Grabit mini figures in the future. Check out the interview after the break! Barbecue17: So, who am I speaking with in regards to this project? Is this a real person or that green Grabit holding the pen? Leo, what inspired the idea for the Grabit? Was there some particular household need that just wasn't being met by a non-robot? LF: The idea for this robot came about because Angie and I couldn't find any cool toothbrush holders anywhere. They were either too plain, gaudy or too funky looking. We also wanted a bottomless holder in order to avoid toothpaste gunk build up. So that was the original idea; the inspiration is a different story. Tell me a bit about the design of the Grabit: how did you come up with this particular look for the robot? LF: I love the Hala lamp; if you see Grabit's head you can probably see a resemblance. I also loved the Dunny and Munny figures from kidrobot; they're chunky cute baby like figures. So with Grabit I intended to create a cute chunky looking robot, with a cool looking round head, that was unique enough and it would stand alone from others. I wanted a little guy that would represent our brand. Hopefully one day, if our company ever takes off, people can identify it with Grabit. The design was first focused mainly on appearance and the functionality was built upon it as we went through the different design iterations. What started as a toothbrush holder ended up as an "anything that you can put in its hands" holder. How do the "grabbers" work? Are they solid or rubbery? LF: The grabbers are solid, but designed in a way that they can hold anything from a skinny toothbrush to a fat marker. The thumb and fingers have little grooves to hold something as skinny as a pencil. If the Grabit goes through (and it looks like it will) are there any plans for a follow-up product? I'm thinking right now that I would love to have a Glow-in-the Dark Grabit. LF: We have two follow up products that we're pretty pumped about. One is a mini figure series; these would belong more in the world of art toys. It's an ambitious project that we want to tackle if Grabit is successful in Kickstarter. The other product is a kitchen product where we see a necessity like we did with the toothbrush holder. If I may say, Angie was actually the one that came up with both of these follow up ideas; my goal will be to bring them from an idea to a product. What has been the biggest challenge for you in creating this product and planning on how you will get it to consumers? LF: We've had a lot of challenges, not sure how to rank them in order of difficulty. I wasn't trained as an industrial designer, my background is in engineering. But I have a passion for art, coming up with the concept art and initial sculpture of Grabit was fairly easy. However, creating the homemade prototype out of resin, then modeling it in 3D with open source software turned out to be quite challenging. It was a self taught process and open source is not as easy to use as expensive off the shelf robust software. The other challenge was finding a manufacturer in the US. That was a challenge we couldn't win. We identified folks that either A) didn't feel like they could tackle this project because it required complex molds, or B) they were down right too expensive (3 times our current costs). We ended up going with a company with great representation in the US that has its factory in China. They are very ethical and we have no problems with the language barrier. We are still trying to figure out what to do about fulfillment after Kickstarter. So that's a pending challenge. But as far as our Kickstarter backers are concerned, Angie and I will personally pack and ship the robots that way we can add a personal touch. They deserve it, since our backers are the ones that potentially will Kickstart our dream. 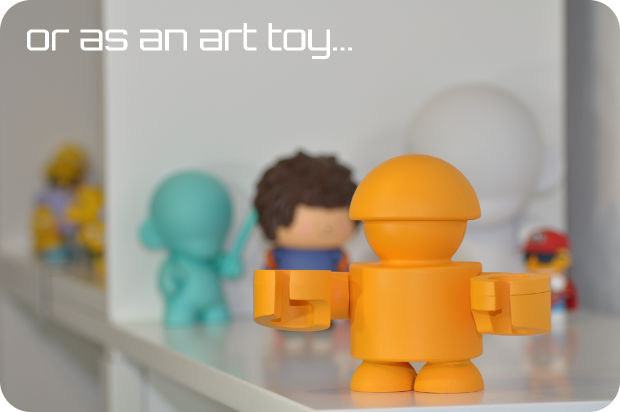 Did you have any experience in the toy industry prior to this project or is this a completely new endeavor for you? LF: Completely new endeavor for me, but I love this more than anything I've done before. Are there any Grabits in your house right now? If so, what are they currently holding? LF: I have one in my cubicle holding my pens and pencils and we have all 5 color robots on our bookshelf along with our other designer toys that we've bought over the years. You mention these as being a tribute to vinyl toys: Do you actively collect toys yourselves? If so, what do you collect? Ok, hypothetical question: Once created,the entire first run of Grabits becomes self aware and they decide they want to come and take over your home as their base of operations. You are the only defense humanity has against the Grabit threat and can choose a team of any three robots (real or fictional) to aide you in putting the Grabits back in line. Which robots make your team? LF:I would call upon Astro boy and the Iron Giant. Then I would get WALL-E to clean up the mess, hee hee. Thanks so much to Leo for his time and best of luck to the Fajardos on their new endeavor! Head on over to Kickstarter right now and chip in for a Grabit today! If you know of a cool new toy project that you or someone else is working on, let us know at thepicreview@gmail.com! Barbecue17 could do twice the work with only 9/10ths of the complaining if he had his own army of robotic minions. He doesn't, and is relegated to writing action figure reviews on Amazon and of taking pictures of action figures on Flickr.